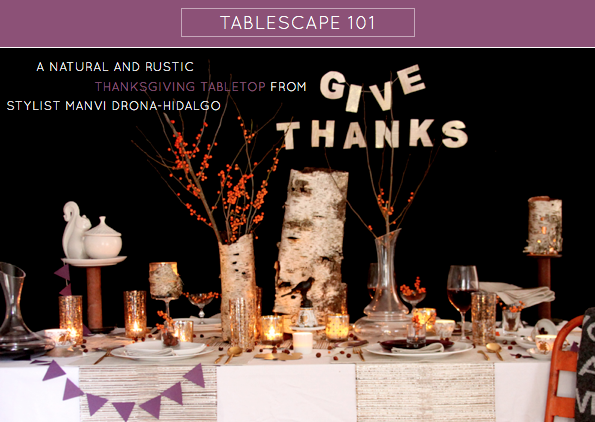 The lovely Manvi is back with her second column in the Tablescape 101 series, this time sharing her ideas and inspirations for a Thanksgiving tabletop. 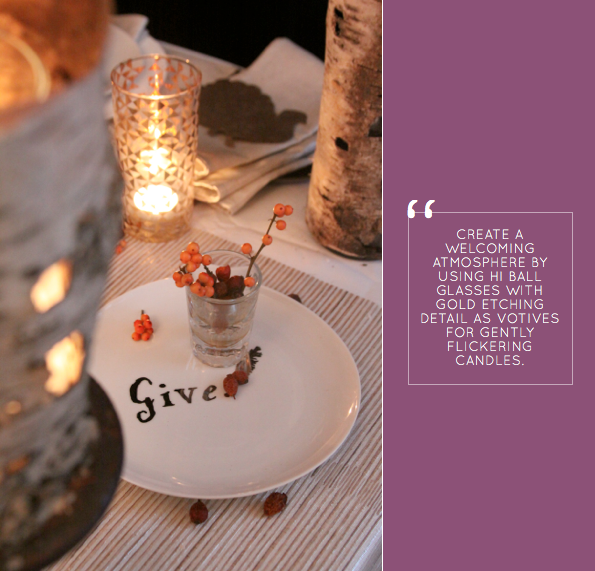 For those of us who aren't in the States or don't celebrate the holiday, there are still fantastic ideas for throwing a natural and rustic-inspired dinner party. After all, what better excuse to gather with friends than to say thanks for the people and things we appreciate? Take it away, Manvi! 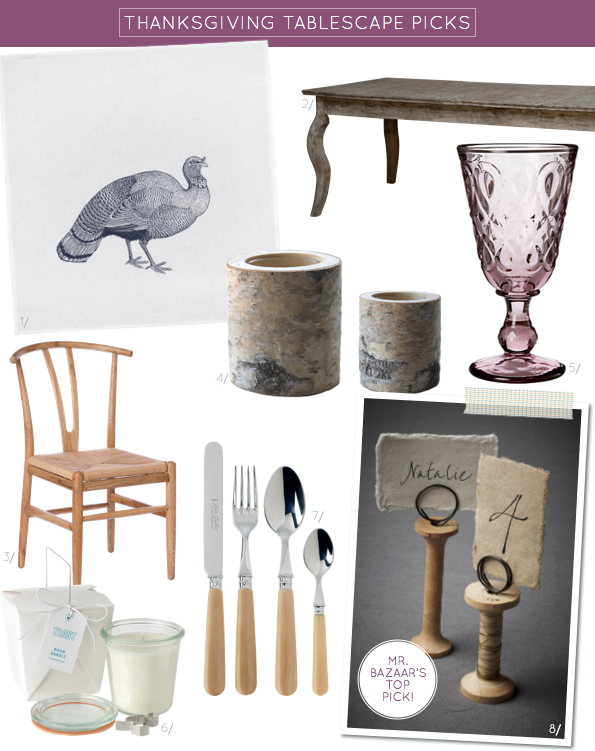 Rustic glam is a perfect description, I love all of the items you chose Manvi. Love the saturated colors too! Wow! Beautiful table! My favorite parts are the vintage spools and mercury glass. I love all of the varying heights too! Just gorgeous ... and how cute is that squirrel holding a bowl! Makes me wish we celebrated thanksgiving! Loving this look! It almost makes me wish it was cold and I could be all snug and enjoying this beautiful table! @Heather - The vintage spools are great for adding height! @Marina - I agree, the Jonathan Alder squirrel is adorable! @Hoolah - Throw a party to say thanks instead! Oh just stunning! I love the purple and the organic feel is so inviting! I love this rustic mix! I just found you and this gorgeous collage! SO inspiring...it really puts me in the mood for this wonderful time of year. It's blustery outside my window today and feeling much like fall. That photo with the "give" plate perfectly matches the day and my mood. Thank you! Beautiful - loving all the natural textures and the sparkle! 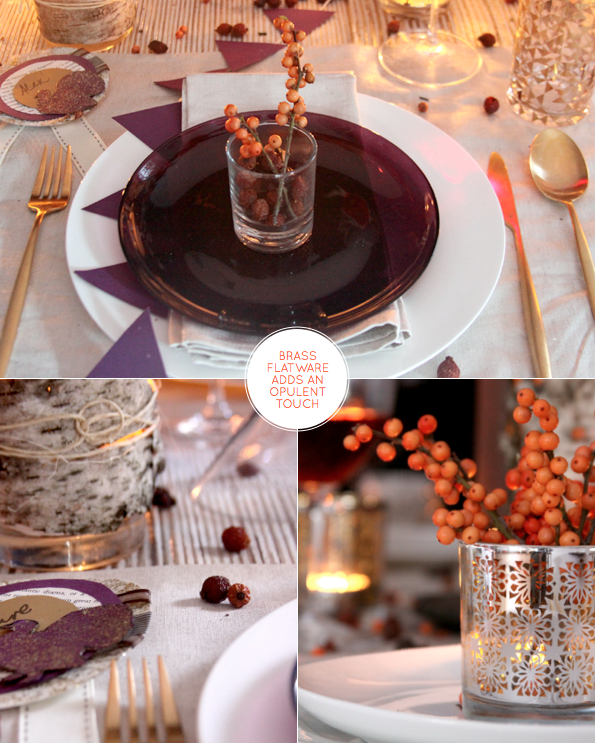 I have those orange berries on my table top at home at the moment - they last so well! Love the purple and natural wood mix! I have purple glasses and plates.. I want to try! really great table ideas. I'm always a bit jealous that we don't celebrate Thanksgiving in the UK, it looks like my kind of holiday! Will, you have to get to NYC to celebrate Thanksgiving with all of your friends from Blogtour 2011! Love your rustic glam table! that is breathtaking. i love of all of the natural elements. 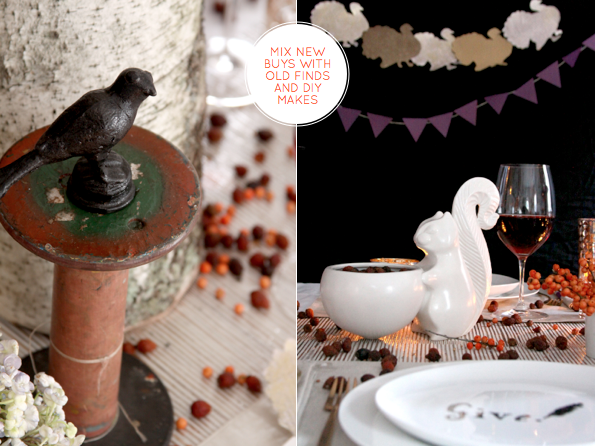 hah cute squirrel and I love that gold etched votive. P.S thanks for your comment on my blog. Will, you are awesome! Beautiful & Inspiring. Happy holidays everyone. This might just change my mind about Thanksgiving. The table setting looks fab! 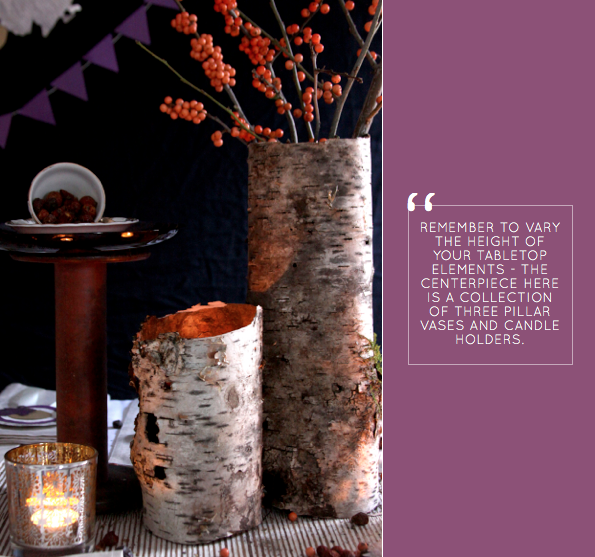 Adore the birch barks and natural elements. The squirrel is a fun touch! 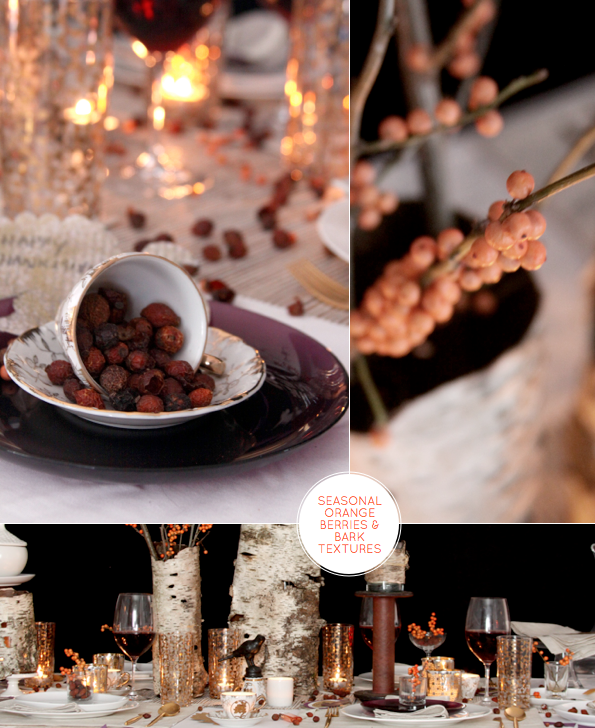 What a rustic but glamorous tablescape. Have a wonderful day. Thank you for all the wonderful ideas.